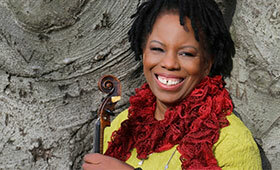 In the realm of jazz violinists, Regina Carter reigns at the pinnacle of the pyramid. Carter, a MacArthur Foundation “genius” Fellowship recipient, makes her sixth appearance on a Penn State stage to honor THE source of her musical inspiration. Carter’s Simply Ella program, performed with her band, features music from the Ella: Accentuate the Positive album released in 2017 to coincide with the 100th anniversary of Ella Fitzgerald’s birth. Carter’s band includes keyboardist Xavier Davis, bassist Chris Lightcap, guitarist Marvin Sewell, and drummer Alvester Garnett. Watch Regina Carter record Ella: Accentuate the Positive.